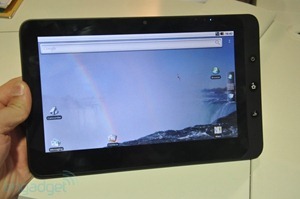 With the possible exception of Archos, there are no big names in the Android tablet field right now. If you have a tablet running a Google-flavoured OS, chances are it’s from Shenzen, has a resistive touchscreen, and will have been superseded by a newer model by the end of this paragraph. Enter ViewSonic. They’re a display company with some fairly well-regarded LCD monitors, which should bode well for the display of their newly announced, previously-rumored tablet.